When I was pregnant with my first child, I agonized over the decision to stay home or go back to work. I grew up on a farm in rural Oregon, with a mother who stayed home while my father worked. I had no idea what working with kids would look like. But I had spent a lot of time and money on an undergraduate degree in bioengineering and a graduate degree in public health. I wasn’t career-driven to the exclusion of everything else, but I was good at my job conducting health research and I enjoyed it most of the time. I made preparations to return to work, but knew that if I couldn’t handle working and taking my baby to daycare, I would stay home. But my maternity leave was tough. My baby was fussy and I had never worked so hard in my life (and for growing up in a farming family, that’s saying something). I was exhausted, depressed, and ready for a break. And ready to have anything be about me and feel appreciated again. So I went back to work. It wasn’t and isn’t easy, and at times I wonder if I’m making the wrong decision. I feel like I am always trying to catch up on my life. That load of dishes a stay at home mom does after breakfast greets me at 4 pm when I get home. There isn’t much opportunity to do a quick load of laundry during the week. Swimming lessons have to be after work, which means they interfere with dinner or bedtime. Every morning I have 45 minutes to have everyone fed, dressed, and packed up for the day. I’m chronically getting to work 15-30 minutes later than I intended. I feel like I’m constantly trying to balance what I owe my family versus what I owe my job. It’s definitely not easy. But despite those challenges, I’m happy to work, and to have a part of me that isn’t defined by someone else. People usually assume a mother’s decision to work is financial, like there can be no other motivation for her to keep her career. While many of us working mothers appreciate having two incomes, that’s not the only reason we work. If I wanted to stay home with my kids full time, I would. Women who worked long and hard to obtain an advanced degree and pursue a career are often reluctant to give up all that work. They worry that if they take time off when their children are young, it would be nearly impossible to get a job again. Plus, work is often more than a paycheck. There is professional satisfaction and pride, in addition to engaging with people socially. Further, not every woman feels like she is cut out to stay home with her kids all day. A highly educated woman I work with recently told me that she is envious of the women who stay home with their kids and do a great job in that role, but that she didn’t think she would be able to do it. Another said she couldn’t imagine spending that much time at home, that she wanted to be challenged intellectually, and she gets that at work. I chose to keep my career. But I would be remiss not to acknowledge that I work with a pretty fantastic group of people. I work primarily with women, and most of them have children of their own. They understand, empathize, and mentor. They encourage me to be a mother and pursue my research career. And no one thinks that I’m not valuable because I work reduced hours or have three times each day where I need to pump. Kids definitely change how I approach my career. I don’t waste time; I work faster because I know I can’t stay late. My kids expect me to pick them up at a certain time, and my maternal guilt won’t let them be at daycare any longer than they have to be. So I work through lunch, and if absolutely necessary, do a bit more once the kids go to bed. When I hear discussions about keeping women in the work force, I think what people fail to acknowledge is that after becoming a mother, your maternal drive to care for your child often trumps other pursuits. And although there are women who want to work, they are still a mother and that isn’t something that can be shut off. And for mothers, allowing someone else to care for their babies isn’t an easy thing to do. So they opt out of the work force. This same maternal instinct that causes women to stay home instead of working is why women cry after dropping off their infant at daycare. It’s why they feel guilty for having a good time out with friends if their baby cried when they left. It’s why they will be bone weary, yet still feel like they should comfort their screaming infant in the middle of the night. So if society really wants women with young children to stay in the work force, we need to acknowledge that working mothers are really working two full-time jobs. We need 80-hour work weeks to not be the norm. We need people we work with to recognize that we can’t stay late, or work on a weekend, or put work ahead of everything else. Honestly, I think that’s true for everyone, not just working mothers. But if there is a group of people who retain that heavy work load, keep their ridiculous hours, and always put their job first, everyone else is forced to be that way too. If the working norm changed in our country, I think you would see more women choosing to opt in to the work force, instead of opting out. Really well written article ,Leslie. I agree with everything you stated. Somehow I think it will always be a dillemna for mothers. When the boys were young, I chose to stay home for many reasons, and in that era I was judged as terribly unliberated to not be a working mother! Things do seem to go full circle, and I think the important thing is for others to accept each mothers individual choice and support it regardless of their own personal feelings. Especially in the case of motherhood “one size does not fit all!” By the way, you are doing a great job! 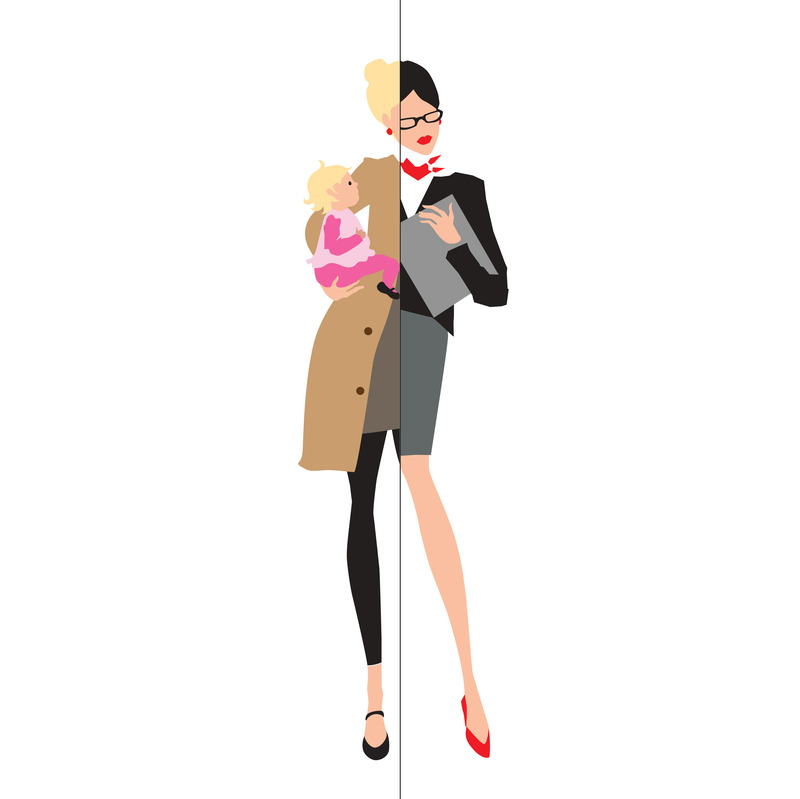 Thank you for voicing so accurately the challenges facing working mothers, the balancing act created by our hopes, internal struggles and external expectations. It was refreshing to read a realistic account that is exactly what I have been living since having my first child ten years ago. I’m so glad you liked it, Barbara! I had no idea how tough it would be to work with young children, and I’m sure I’ll have even more challenges as my kids start school. I am a 60-year-old mom of two incredible daughters. I graduated from high school waaaay back in 1972. I tell you that because I have an odd perspective on being a working mom. One of my husband’s female business associates: So, what do you do? Me: I’m a mom, I have a wee one at home. Business associate: Yes, but what do you *actually* do?!! All women were suddenly expected to work and still do all the mom things. We drove ourselves nuts, trying to be the supermom and keep up with all the other supermoms. I started my own business, teaching people to use their computers. I was able to work my schedule so that I could still have time for my brain and social life, but I spent a great deal of time with my kids, too. I couldn’t imagine being with them 100% of the time, but they never felt unloved. Today, they are my friends, grown women I will always be proud to know. All that being said, no one can tell anyone else how to do the mom/work thing. Everyone has to figure it out themselves. One thing we did that they really appreciated (they have told me now that they are grown) is this: The more you work, the more important it is to have the time with the kids mean more. Chores and all of the “have-to-do’s” can be done with music and dancing or races or something that lets them know that you acknowledge them and enjoy their company. Appreciate who they are and just enjoy the time you have with them. Don’t sweat what you can’t do or control and know that you will have time to sleep when they are just a bit older. It comes much faster than you think! Hang in there & have lots of fun! Instead of always seeing employers giving veterans credit in the hiring decision, I’d like to see mother credit being considered too – we are warriors of a different kind, a set of distinct juggling skills that adds amazing value to society and to companies, yet those talents get sidelined in favor of dolts whose skills are getting the job but not really caring or making a difference. Mothers need to be able to support and provide for her future and the future society that are her children, yet these other people get put in the driving seat creating a societal environment that does nothing to improve the quality of life for everyone, unless its rebuilding a country they tore apart through war, and even that rebuilding does nothing but replicate mass consumerism already seen as a wasteland here at home. So how is it working out there with the occupation of what were formerly womens jobs now being usurped by those invested in military industrial complex – its not, its made nothing but a mess out everything. What was once thriving, is now just hell of a displaced worker economy, older experienced workers become unwanted.